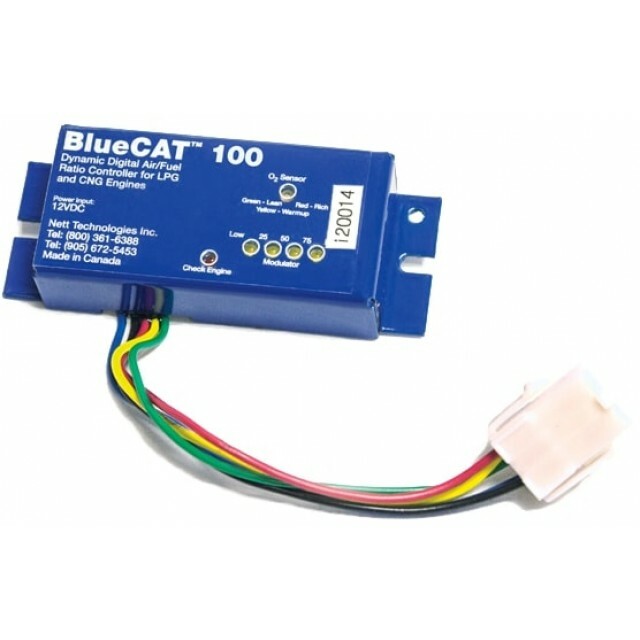 The Nett Technologies' BlueCAT™ 100 is an advanced electronic air/fuel ratio controller for LPG and CNG (stoichiometric) mobile equipment and small off-road applications. It functions very similarly to Dual Curve's PN 5952 Digital Fuel Controller but improves upon Dual Curve's design by incorporating an on-board monitoring system directly on the module. 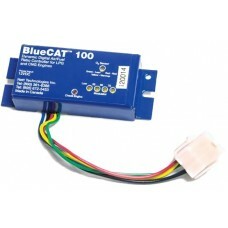 Integrated into this controller is the equivalent of the Dual Curve PN 4041 - Mixture Monitor. The system is designed primarily for use with Nett 3-way catalyst systems in closed-loop configurations but will work with standard automotive 3-way catalytic converters. By precisely maintaining the optimal A/F ratio (also known as the stoichiometric A/F ratio) under all engine operating conditions, the unit maximizes emission reductions in the 3-way catalyst. The controller also reduces fuel consumption and increases engine life. The controller incorporates an on board diagnostic system, which allows for constant monitoring of its operation and simplifies set-up. The combination of lights built directly into the unit provides an indication of the controller operation without the need for additional monitoring tools. The diagnostic functions include a power and failure light, a warm up and O2 sensor light, and a set of lights to monitor the percentage of A/F ratio modulation. The unit also includes an optional, dashboardmounted warning light to alert the operator in case of system failure and to prevent the release of excessive emissions. Although designed to be compatible with Impco systems, it is also compatible with most gaseous fuel systems using either LPG or CNG. For vehicles with catalytic converters in the exhaust, the use of a feedback air-gas valve is required to maintain a stoichiometric fuel mixture for low emissions. For off-road vehicles without a catalytic converter, this controller may be used with the standard and lean gas valves to ensure that fuel economy does not suffer when the engine is warming up. 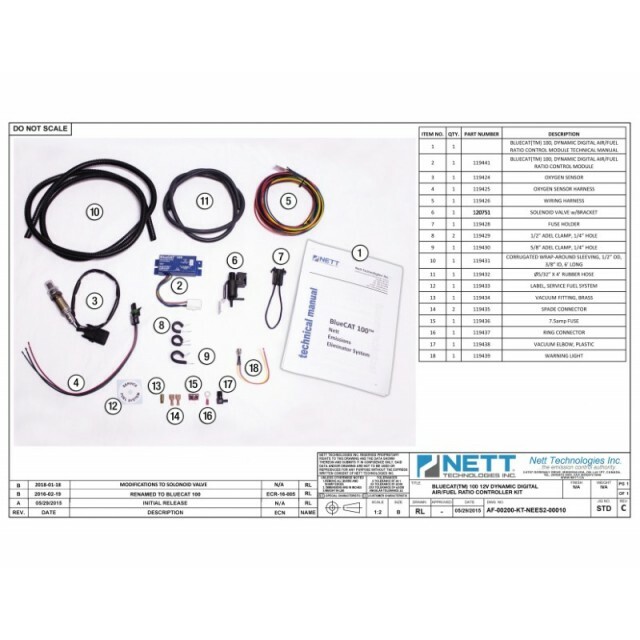 Detailed installation instructions are included in this kit and this fuel controller is very easy to set up. For both idle and full-throttle power for feedback operation, the fuel mixture should be adjusted so that the controller alternates evenly between rich and lean operation. A single fuel mixture control module may also be used to control two converters with the addition of a vacuum tee and a second vacuum orifice elbow. For systems without feedback gas valves, after reaching operating temperature, set the idle for the highest and smoothest idle and set the power adjustment for best power on the lean side. This is usually about 2% exhaust CO at maximum load. When the engine is cold, the controller will keep the fuel mixture from becoming too rich. With short trips in cold climates , this makes a big difference and has a quick payback.